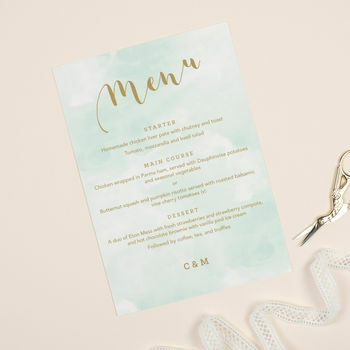 Mint and gold Romance watercolour wedding menu cards. Complete your table setting with these pretty mint and gold watercolour design menu cards. Once you have placed an order you will receive a digital proof within 3 working days. Once you have carefully checked and approved the design and text we will send the artwork to print. If we need to make any amends prior to printing we will do so and follow up with another proof for you to accept. Please note that we allow 5-7 working days for delivery from approval of the proof. Printed flat on 300gsm textured card. Available 5x7" or A5 (14.8cm w x 21cm h) size. This product is dispatched to you by Project Pretty.